2014 Kuberg Cross. Picture credits - Kuberg. Submit more pictures. Promotion to the next division. 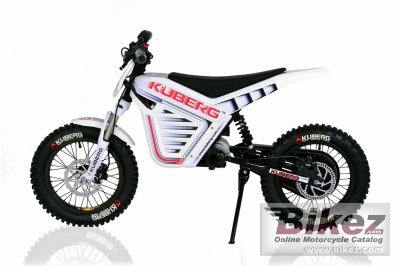 CROSS is the world�s first electric MX bike for riders from 5 to 12 years old! Thanks to heavy duty design and quality parts this bike will easily carry riders up to 220lbs! Amazing extra powerful motor delivers serious riding experience with lots of instant torque for incredible acceleration. High quality custom made suspension and great brakes will help the riders to build up correct riding techniques. Comments: 6 hour charging time. Intended for children.Range up to 2 hours. 12Ah SLA x 3 batteries. Ask questions Join the 14 Kuberg Cross discussion group or the general Kuberg discussion group.